Their exquisite coloration and royal demeanour make kingfishers an object of every bird lover’s admiration. 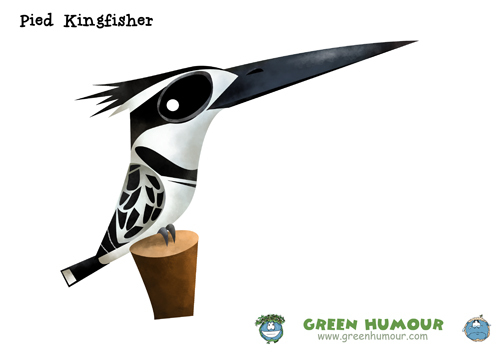 India has 12 species, of which the commonest are the White-throated and the Common Kingfishers. 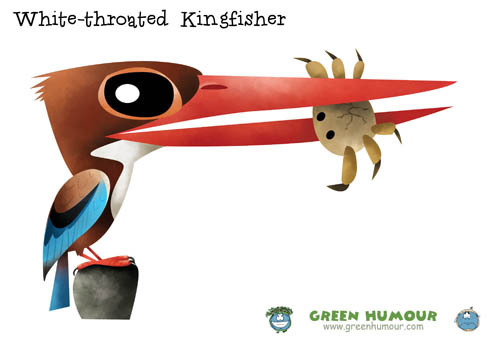 The Sunderbans are thought to be the richest zone in kingfisher diversity. 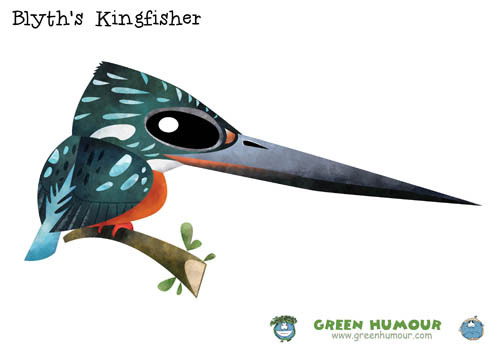 Contrary to what the name suggests, most kingfishers do not subsist entirely on fish but are versatile and fearless hunters, taking everything from frogs, small birds, rodents and even snakes. 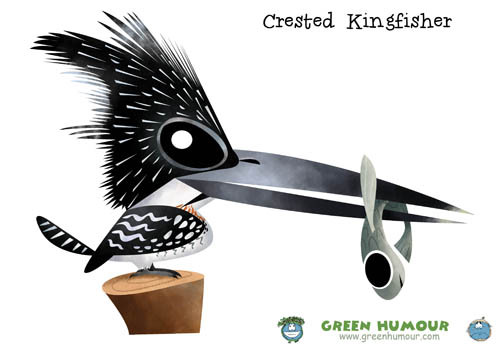 Also known as the Himalayan Kingfisher, the Crested Kingfisher is the largest kingfisher in India. It is black and white and appears like the larger version of the more common Pied Kingfisher. It inhabits mountain rivers and hunts along fast flowing streams. Large and robust, characterized by the heavy stork-like bill, this bird is a resident of well-wooded habitats. Its loud cackling call often gives it away. 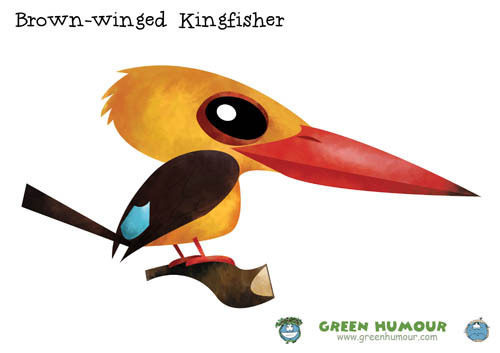 The Brown-winged Kingfisher is a specialist hunter of the mangroves, and quite naturally, has been reported in great numbers from the Sunderbans. I nests in holes along river banks and preys on fish, frogs and crabs. 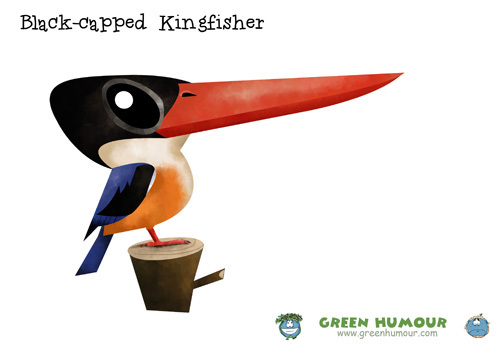 A striking looking bird, the Black-capped Kingfisher is also a resident of mangroves and coastal waters. Like other tree kingfishers, it prefers tree holes to nest and hunts a wide range of prey including frogs, fish, crabs and young birds. The Pied Kingfisher is one of the most handsome birds found in the region. An extremely agile fisherman, the bird is renowned for its dives. The kingfisher hovers in mid-air on locking its tagret and performs a steep, vertical, swift dive to procure it- a spectacular sight etched in the memory of every bird lover. This glossy blue jewel inhabits mangroves and estuaries, and is easily identifiable by its white collar. Several sub-species of the Collared Kingfisher have been described, occurring over a wide range across Eurasia and Africa. The Ruddy Kingfisher is another tree kingfisher seen around mangroves and islands. It has an extensive range through South-east and East Asia. The rusty red colour and brilliant red bill and legs serve as pointers for identification. One of the commonest kingfishers in India and probably the least dependent on water among all kingfishers here, this spectacular looking bird is well known to birders and laymen alike. Its loud ki-ki-ki-ki call often gives it away. A fearless predator, it can take absolutely anything within its grasp, including rodents and snakes! The Common or the Small Blue Kingfisher is a small, exclusively fish-eating kingfisher seen commonly around ponds, lakes and rivers. It can often be seen speeding like a bullet parallel to the water surface. It hunts by hovering and diving. 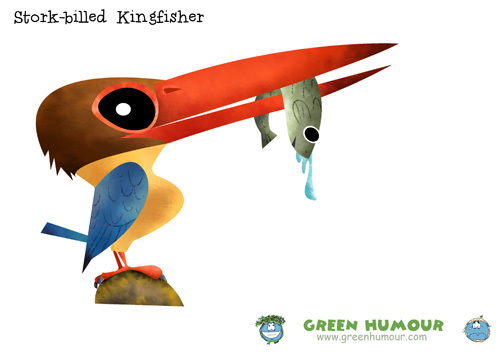 A close relative of the Common Kingfisher, the Blue-eared Kingfisher occurs along streams and rivers in dense forests. The blue ear coverts separate the species from the Common Kingfisher. Named after Edward Blyth (an English zoologist and Curator of the Museum of the Asiatic Society of Bengal), this bird is also closely related to the Common Kingfisher and occurs along streams in evergreen forests at relatively higher elevations. Like always- the best for the last! Sporting an entire colour wheel on its body, the dwarf or the three-toed kingfisher is one of the world’s most striking birds. It is a very shy resident of rainforests and nests along streams amid dense forest cover and breeds with the onset of the south-western monsoons. It feeds on a wide range of prey including frogs, lizards and crabs. The kingfisher mug and magnet set (you can pick any four of your favourites for the magnets and any six for the coasters). What are the price for T-shirts in India. I couldn't find any links for placing orders and pricelist of t-shirts within India. Redbubble is for placing orders outside India..